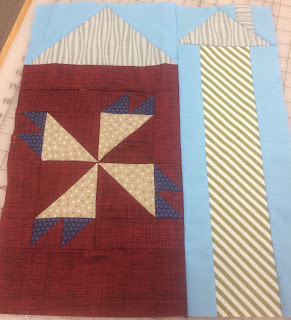 And here is a peek at her block number 2 ~ How cute is this striped silo! Block number 4 is available for download from the Free Pattern Page of our website. 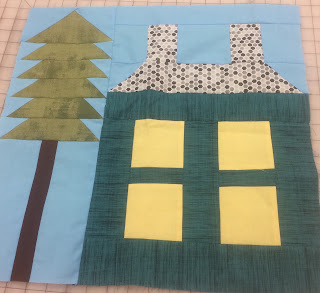 Moda Be My Neighbor Quilt Along! Moda is hosting a Quilt Along to celebrate our community of quilters ~ Have you heard about it? As a participating shop, we will provide a series of 16 free downloadable “blueprints” – block patterns each week and will run through December 19, 2016. All new blocks will be posted on our Free Patterns Page of our website every Monday (Blocks 1 - 3 are available there now). The blueprints will be rendered in gray-scale to allow everyone to color their neighborhood using a wide variety of fabric and color choices. Setting instructions will be distributed with the final block. These are very scrappy blocks so exact yardage for a set number of fabrics has not been calculated. Just mix your favorite fabrics to create your very own quilt-hood. So come on, won’t you be our neighbor?